During the press conference, a group of artists led by the collective OPAVIVARÁ protested against the new government of Michel Temer with the catchphrase “Diretas Já”, demanding direct presidential elections. Later, during the professional preview, more artists joined in shouting via the loudspeakers from OPAVIVARÁ’s installation Transnomads (2016), and wearing black and white t-shirts with words “Fora Temer (Get out Temer!)”. A banner was affixed to the parapet wall in the third floor of the pavilion. It was exposed to the audience that gathered to watch Cristiano Lenhardt’s performance of a maypole dance in which the dancers braided the pavilion columns. Recalling the dark times we are living in, instead of the multi-colored ribbons of folkloric dance, Lenhardt’s intervention turned iconic columns of Niemeyer’s pavilion black. The 32nd São Paulo Biennial addresses some of the most pressing issues of our times: survival of life on earth, global warming and environmental sustainability, economical and political crisis, humanitarian conditions of minorities and displaced persons, among others. According to the curator, Jochen Volz, “it is necessary to detach uncertainty”, the exhibition’s theme, “from fear”. 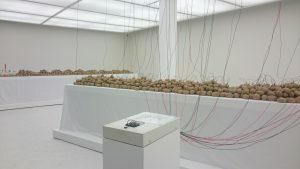 In this positive sense, art can play an important role, promoting “an active exchange between people, recognizing uncertainties as guiding generative and constructive systems”. 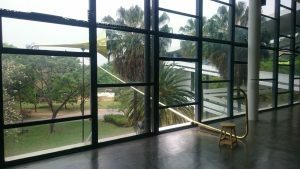 This affirmative perspective is in conformity with Volz’s previous experience as director, from 2005 to 2007, and artistic director, from 2007 to 2012, of the Inhotim Institute. Located in the countryside of Minas Gerais state, it is a complex of pavilions and galleries devoted to the big stars star in the contemporary art world. Inhotim offers a conciliatory position between art and nature in which the spectator experience is activated simultaneously by gardens, forest landscapes, large-scale displays and spectacular installations. Correspondingly, the 32nd São Paulo Biennial expands the viewer’s experience of the site beyond the walls of the Pavilion, to the Ibirapuera Park, and invites to recognize the garden as an essential element of Volz’s curatorial framework. 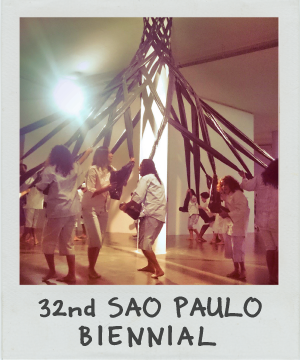 It seems also that the 32nd Biennial aims to rekindle artistic engagement and participation from the 1970s. Artist Jorge Menna Barreto spends his days in the exhibition managing a restaurant in partnership with Vitor Braz. Unlike other cooking and eating experiences proposed by artists, such as those by Rirkrit Tiravanija, Barreto’s Restoration raises questions about the impact of our eating habits on the environment. 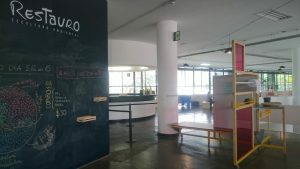 It was done in collaboration with nutritionist and chef Neka Menna Barreto, the Escola ComoComo de Ecogastronomia and the architecture and design collective O Grupo Inteiro. Building on the Joseph Beuys’ concept of social sculpture, they turn the digestive experience into a political act and the audience in participants of an environmental sculpture. Another utopian aspect of the 1970s participatory art present in the exhibition is the relationship between art, spirituality and nature. It is clearly articulated, for example, in the work of Eduardo Navarro who attempts to connect the nature and the audience through an acoustic instrument that promotes an interaction between the spectator and the garden outside the pavilion. Seated in a bench, the visitor can hear the sound produced by a palm tree outside. Navarro’s work interrogates our process of listening and communication. It examines the forms of knowledge production in the scientific field and points out the necessity to develop a non-rationalist relationship with nature. In spite of the good intentions Volz’s show lacks a more systematic critical and historical approach necessary in order to bring art’s healing and political aspects back into the contemporary debate. A revision of São Paulo Biennial own history would reveal that some of the areas of inquiry put forward by Volz – such as environment – were already addressed and explored in the 1970s. The examples are already there, in the wood sculptures of Franz Krajcberg and installations of Víctor Grippo. The first, working with dead trees’ forms and shapes, and the later exploring the relationship between the energy and conscience production. 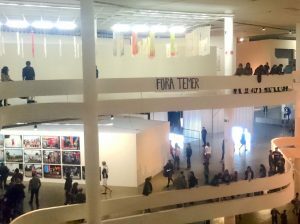 Both artists were presented and awarded in the 14th São Paulo Biennial, in 1977. Volz included these works in his show, however, he did so without any attempt to provide a historical narrative or rationale. Such narrative could not only disrupt the immediacy of the exhibition – otherwise wholly focused on the contemporary condition – but also offer a critical perspective behind the current condition to the audience. The origins of today’s ecological catastrophe dates back to the colonial period in Brazil and the social and economical formation of the country. The garden and forest landscapes always served the colonizers’ taste, while the catastrophe of colonization was in progress. Last year, Brazil experienced the biggest environmental catastrophe in its history in the same country’s southeast region where Inhotim is located. In November 2015, two mining dams ruptured releasing millions of tonnes of toxic mud into the River Doce, causing destruction across the region where the economy is largely driven by mining. It is also worth noting that its founder and main supporter, Bernardo Paz, made his fortune in mining companies and extractive activities. Afterall, a mine would perhaps be a more fitting metaphor for a curatorial framework aiming to delve into the relationship between art and nature, than a garden. Dr Vinicius Spricigo teaches Curating at the History of Art Departament of the Federal University of São Paulo.